Paerdegat Basin Combined Sewer Overflow (CSO) abatement project will store up to 50 million gallons of CSOs during storms. When stormwater surges into sewers it can trigger CSOs when sewers and treatment plants reach capacity, which by design protects the sewer system and treatment plants. CSO tanks reduce this problem by storing flows until storms pass, allowing for allowing for treatment at the plant when the storm subsides. 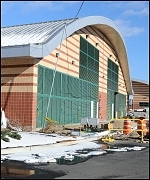 Construction of Paerdegat Basin Combined Sewer Overflow (CSO) retention facility was completed in August 2011. Project cost is $206 million. No increased demand for community facilities in Brooklyn would be required and no existing community facilities within the study area would be directly impacted.